Udaipur: The Honorable Vice President of India, M Venkaiah Naidu addressed the 19th Convocation of National Board of Examinations (NBE) at Vigyan Bhawan, New Delhi, an autonomous body of Ministry of Health and Family Welfare, in presence of Ashwini Kumar Choubey, Minister of State for Health and Family Welfare recently. 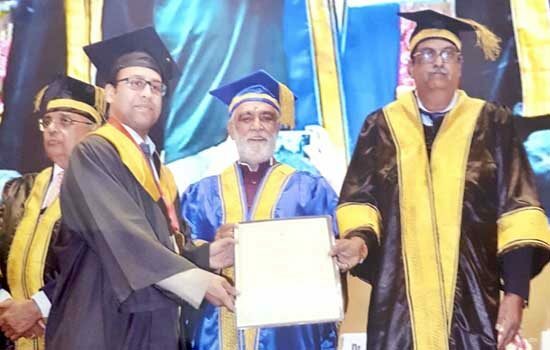 At the convocation ceremony, Dr. Ashish Jakhetiya of Geetanjali Medical College & Hospital has received the Gold Medal in its respective specialty of surgical oncology commonly known as cancer surgery. He received the award from Ashwini Kumar Choubey, Minister of State for Health and Family Welfare and Dr. Abhijeet Sheth, President-National Board of Examinations. He was the only oncology surgeon selected for this award amongst complete India. He was also the one to receive highest marks in surgical oncology to cadre its candidature for the award. He has keen interest in thoracic oncology and has started advanced thoracic surgery at Geetanjali Cancer Centre for maximum benefit to its patients.